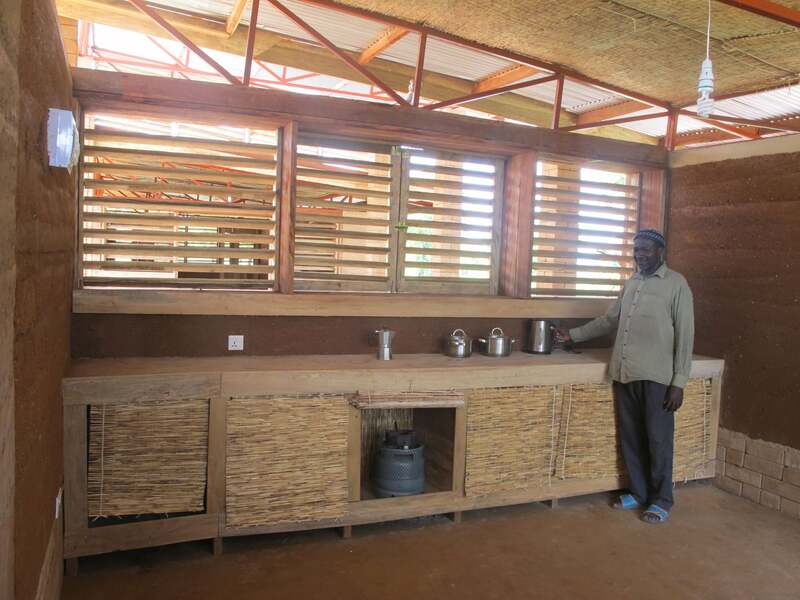 Build in only twelve weeks and with the help of international volunteers and the local community, we have successfully completed the ‘MUDcafeteria’. 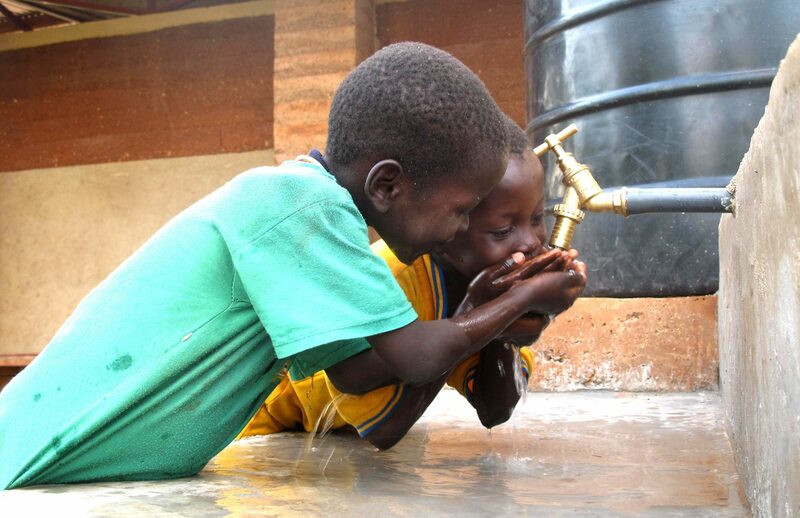 This low-cost project has been financed merely through sponsoring and donations and can be regarded as an example of community driven development. The total costs for the project have not exceeded 20.000,- € and the building is made with foremost local and sustainable materials such as rammed earth for example. 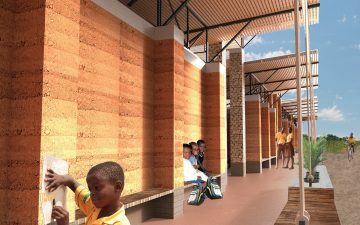 Set in the rural town Sang, in the sparsely developed northern region of Ghana, the cafeteria will be the central meeting place of the future Sang vocational school, that strives to open its doors in 2018. In Sang there are many young people without a proper school education. 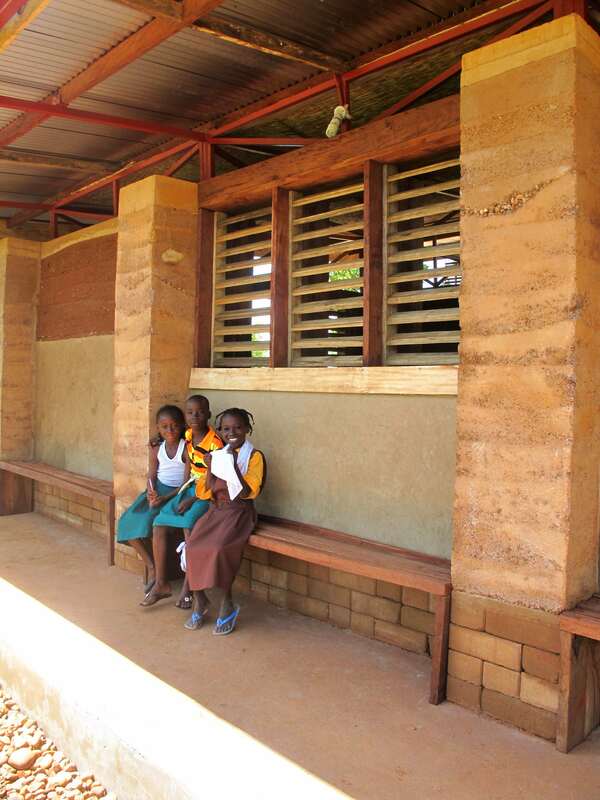 Primary schools, although free, are often overcrowded and arguably do not offer a suitable learning environment. But for many children learning already stops after primary school. 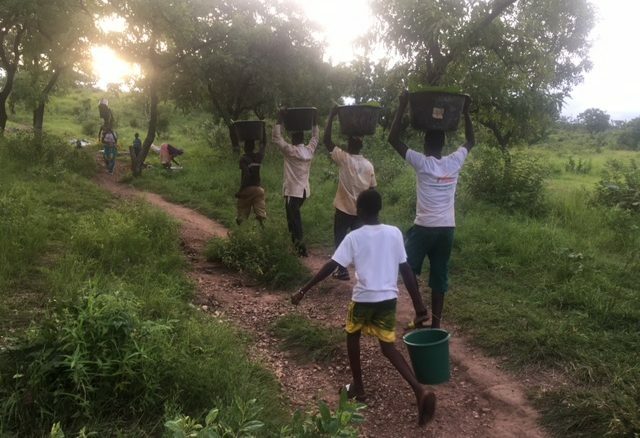 Many families do not send their children to secondary school, either because they cannot afford it, which is often the case, or the children need to help cultivate the land. 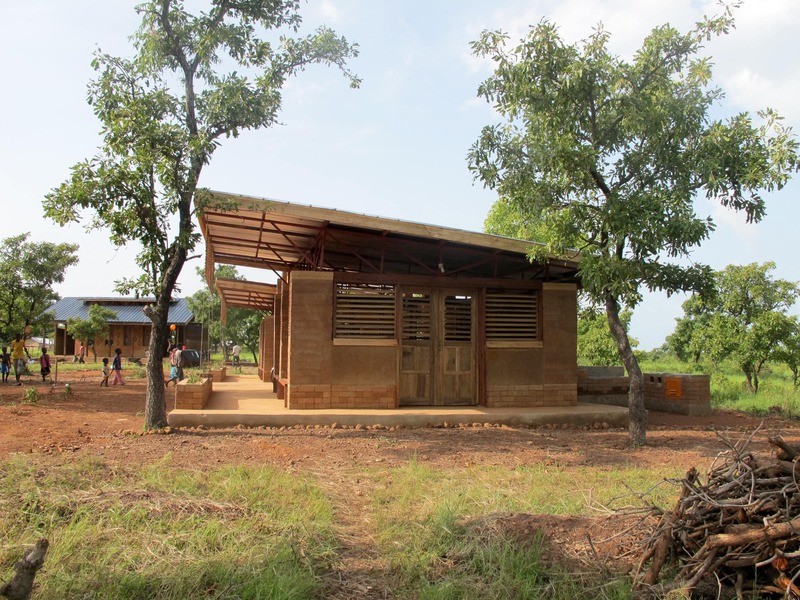 The vocational school in Sang can thus be a new opportunity for many young people without a higher school education to learn a trade and pursue a career as a skilled laborer. 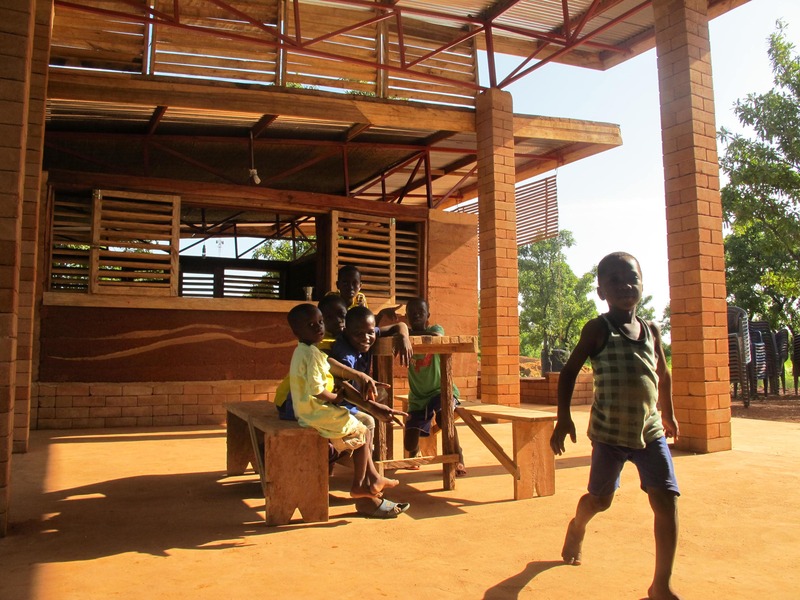 During the summer of 2017 we have built three ‘modules’ of our cafeteria design; a kitchen, a multi-functional room and a large outdoor seating area. 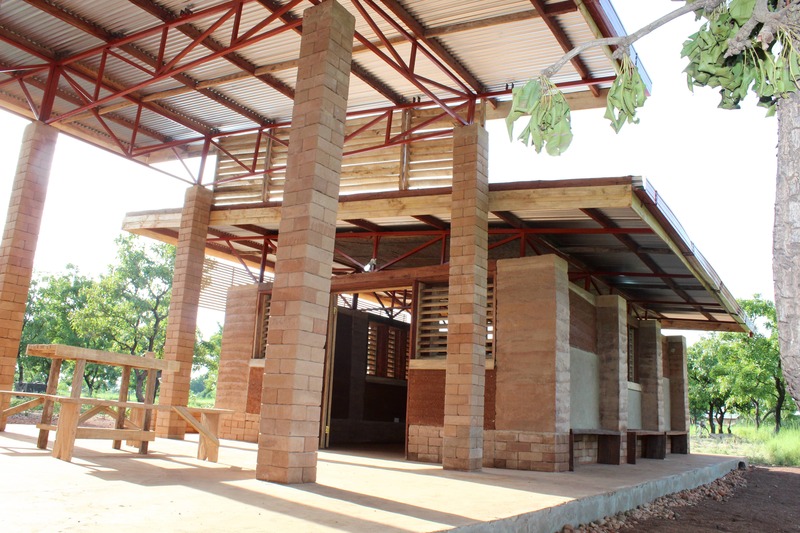 The building is set in a central position of the new vocational school campus and it will serve as the social meeting place for students, teachers and the community. The cafeteria offers various kinds of spaces for socializing, some of them more public and some more private. 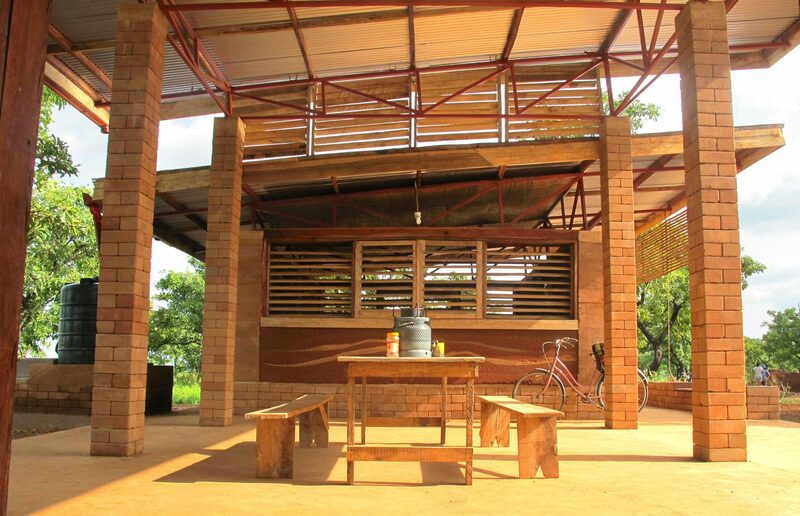 The cantilevered roof, the niches between the walls/columns and the large outdoor area offer a lot of shaded area to sit down and eat or drink something, or to study. We have positioned the cafeteria in such a way that it optimally captures the stunning views of the surroundings. From the back veranda and through the spacious outdoor-area, the building offers beautiful vistas of the valley below. The three modules are constructively independent structures. In this way the composition remains very flexible and new parts can be added without modifying or compromising the existing structure. The modules on the edge of the building are almost identical, the only difference is the length of the module: the multi-functional room is made of three partitions, the smaller kitchen module comprises only two partitions. 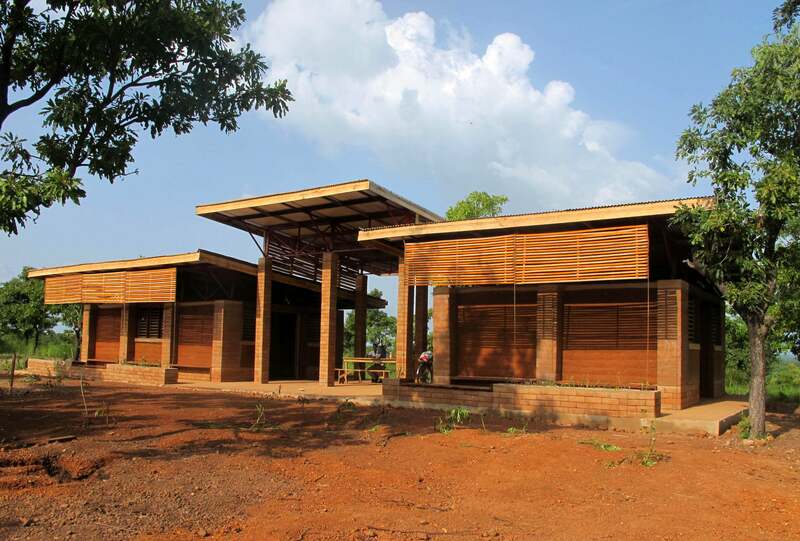 The center-module is a more open structure built with compressed earth-brick columns. Also this module can vary in size; we have built a large one in this case comprising two partitions. 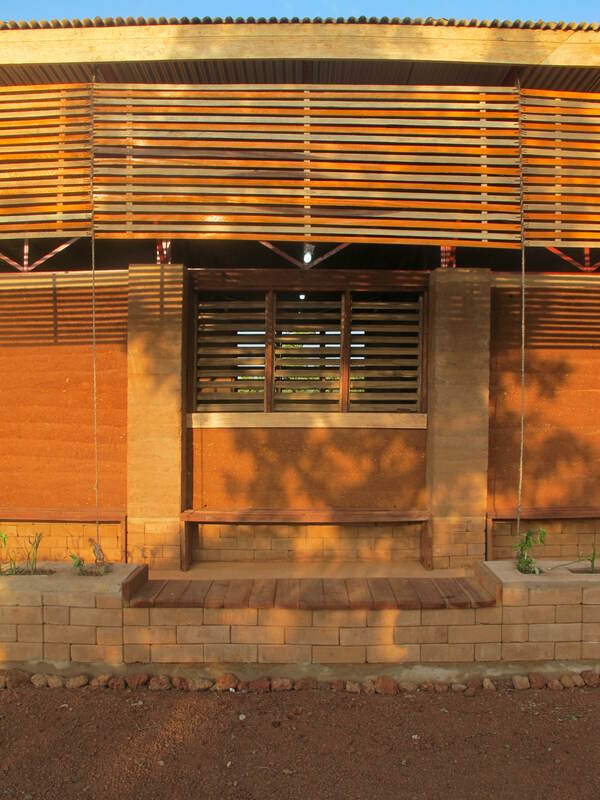 The wall-elements are highly standardized, requiring only two different types of formwork to build them. The trusses that form the roof are also identical for both ‘module types’ , additionally simplifying the building process. 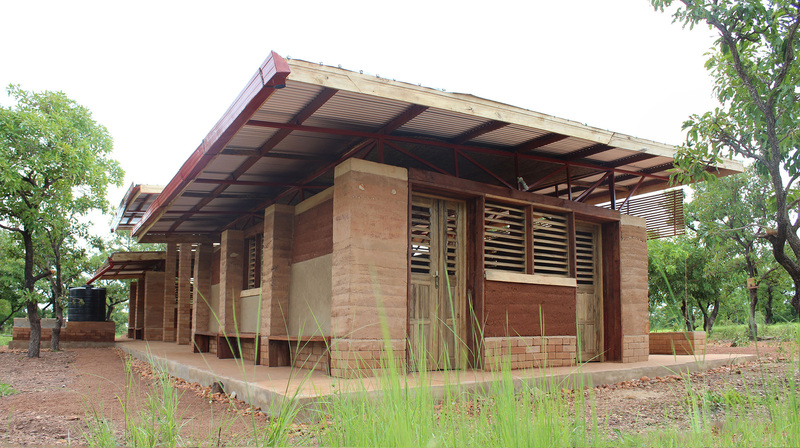 This modular and standardizing approach has reduced the cost of the entire building and it unmistakably has been a necessity for us in order to cope with the limited building time of 12 weeks. 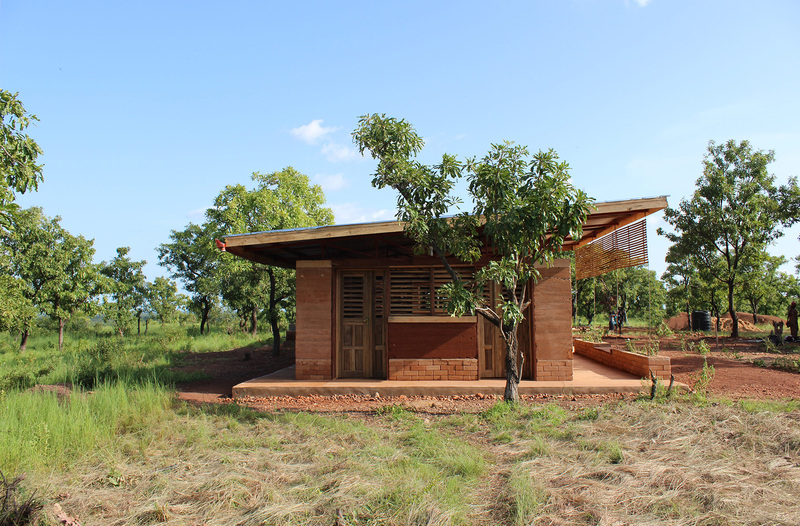 Besides the main structural elements we have built two breastwork elements at the front of the building and a cooking and hand-wash facility at the back. The breastwork elements are a combination of raised plant-beds and benches, built primarily with compressed earth-bricks. These breastworks help to define the veranda space more clearly, offering a nice area for more private interaction especially when the plants gain some more coverage. 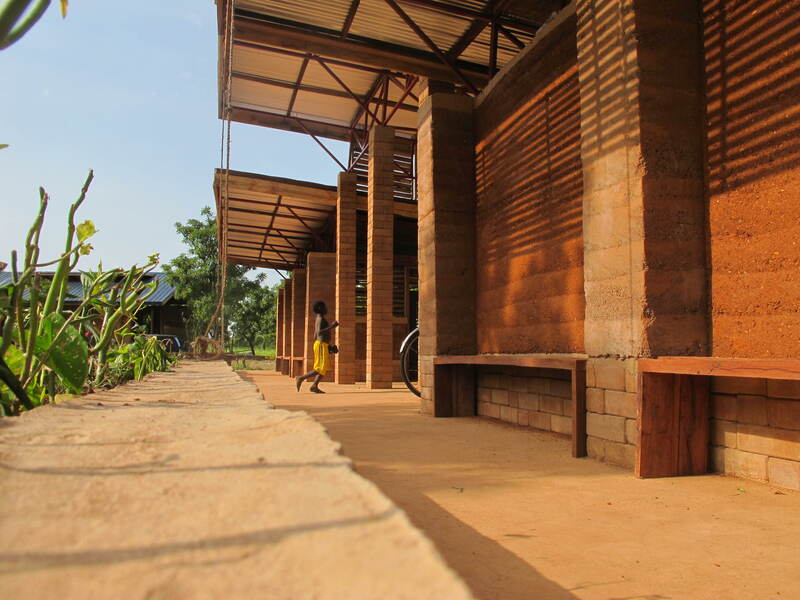 The shades that hang down from the protruding roof are fixed to the breastwork with locally produced rope and provide shade for the afternoon sun. 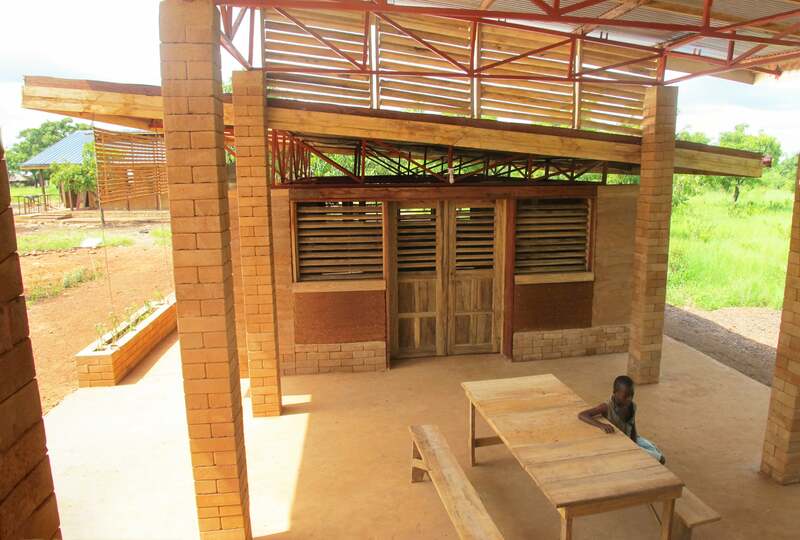 As people in Sang mainly cook outdoors we decided to situate the cooking facilities at the back of the cafeteria. We have created a large cooking element with counter, containing two stoves and a built-in oven. 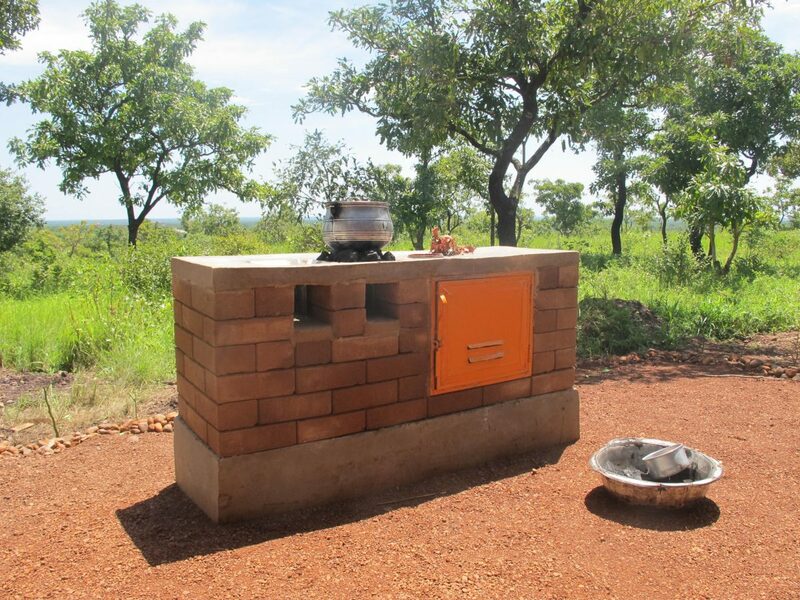 We have built the stoves and oven in such a way that heat is used efficiently. The heating ‘chambers’ are better insulated compared to an open fire place and therefore less energy is spilling into the surrounding air, reducing the consumption of charcoal. 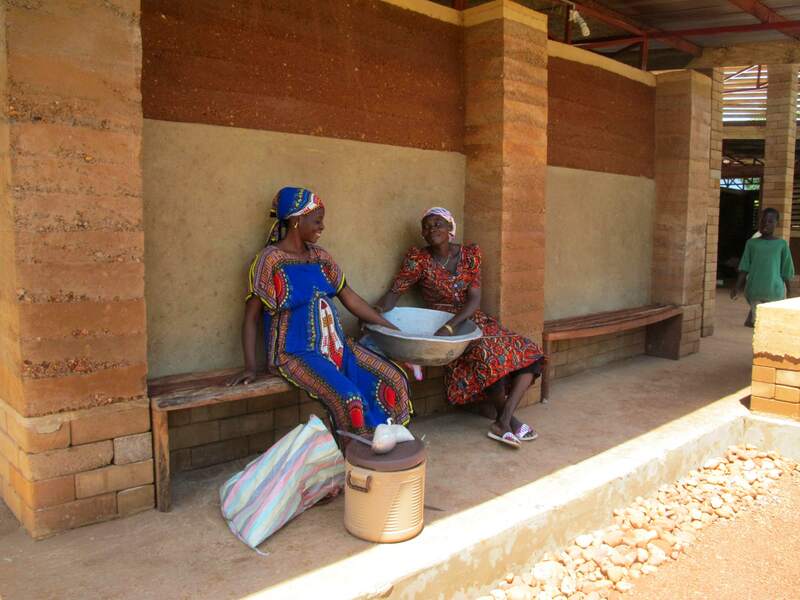 The adjacent wash-basin can be used for visitors to wash hands or it is used for cooking (dish-washing). The basin comprises three taps that are all fed by the polytank right beside. 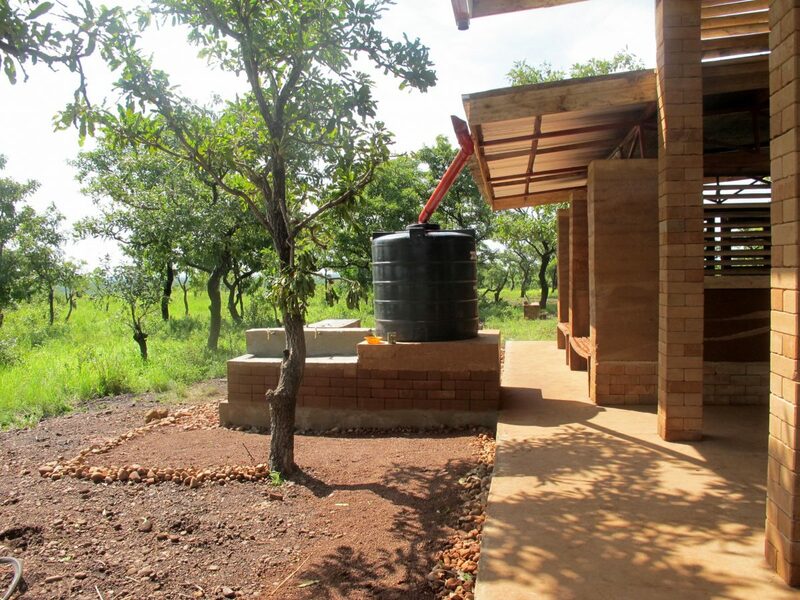 The polytank is filled with rainwater (during the rainy seasons) that is collected from the two connecting roofs. 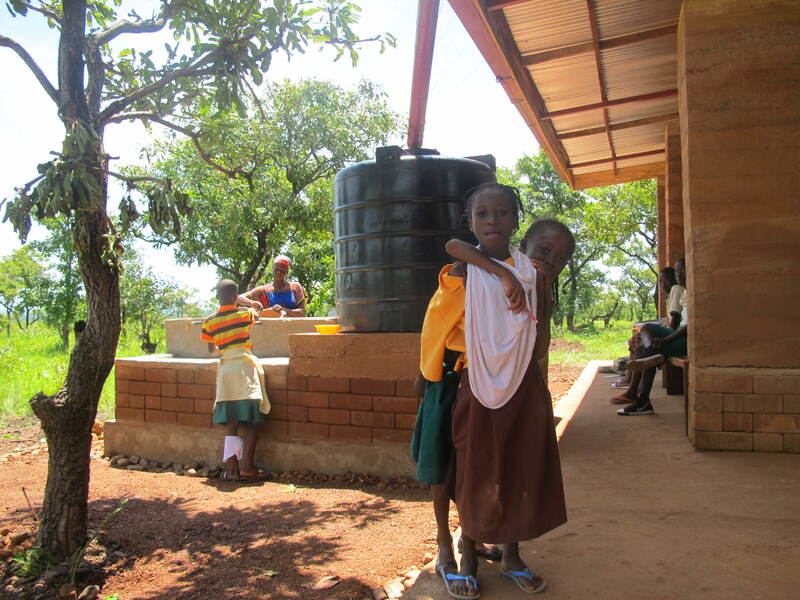 On a heavy rain-day both roofs can produce enough water to fill the 1400 liter tank. 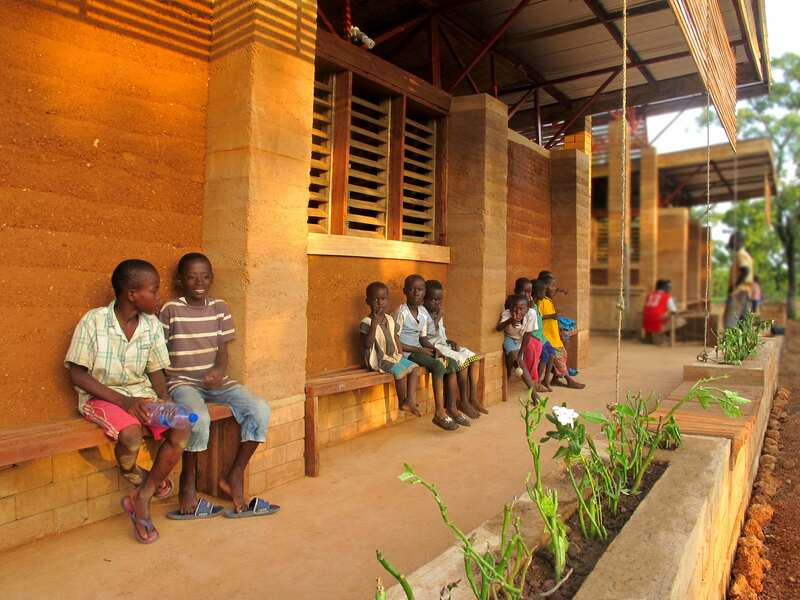 Because rammed-earth walls have an excellent thermal mass, even during the hot hours of the day the indoor climate of the cafeteria remains quite comfortable. Even at the end of a sunny and warm day the two indoor rooms of the cafeteria remain relatively cool. This is also partially due to the favorable lay-out for cross-ventilation. Most of the windows and doors face each other and as such allow for a good air-flow. The open roof-structure assures additional cross ventilation that leads away the heat which accumulates below the metal-sheet roofs. Although there was only little time left at the end for interior decoration, we did manage to produce a kitchen counter. 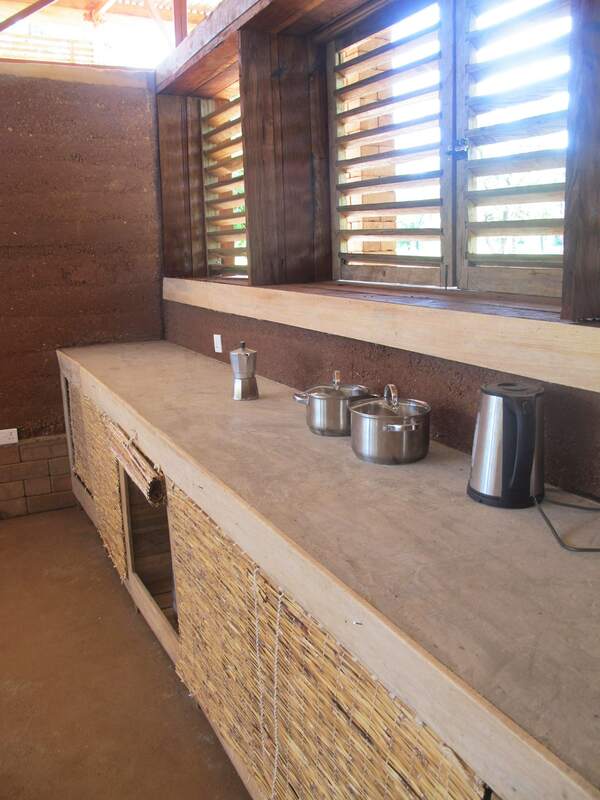 The counter is besides its concrete top-layer solely made with left-over wood pieces from the construction site and it is placed in front of the food hand-out window. The cafeteria is also fully equipped with electricity. Their are power-sockets in the indoor rooms and there is both indoor and outdoor lighting available. Power is provided conventionally through the towns main electrical grid. 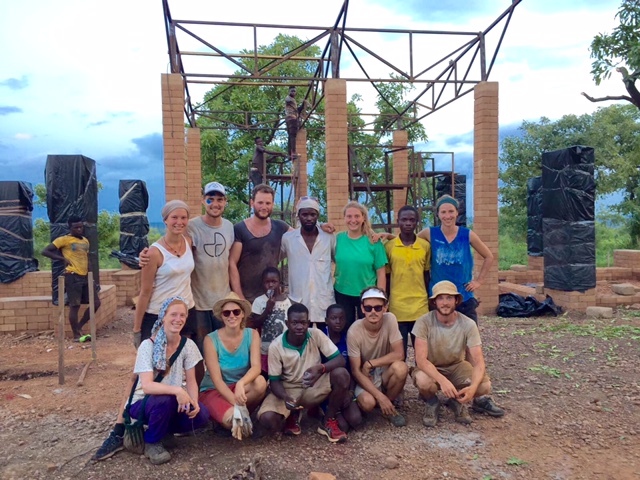 Building in rural Ghana has been a really big adventure for us. Almost every day we have been confronted with new challenges, and the management and organisation of the project has been extremely demanding. The cultural differences are vast between Europe and Ghana and as only few people speak good English it was often not easy to explain our ideas and give clear instructions. But even when the language barrier was not the main obstacle, discussing technical solutions is generally difficult when you are dealing with inexperienced builders. 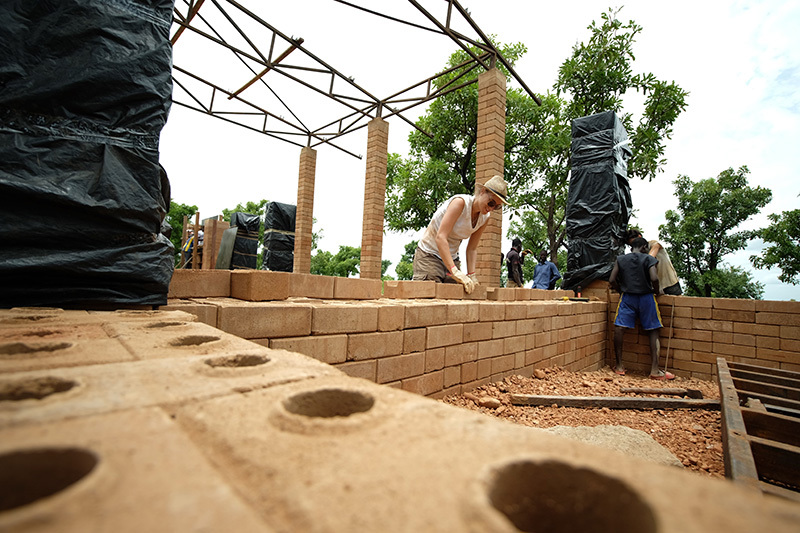 Several people of the NKA foundation (our local partner organisation) spoke relatively well English, they had, however, little to no experience in construction work. We had a local carpenter working for us who spoke good English, the greater part of out team however comprised unskilled laborers with little command of the English language. And even though motivated and hardworking, they lacked specific building experience or professional skills which made it difficult for us to outsource tasks without constant monitoring. 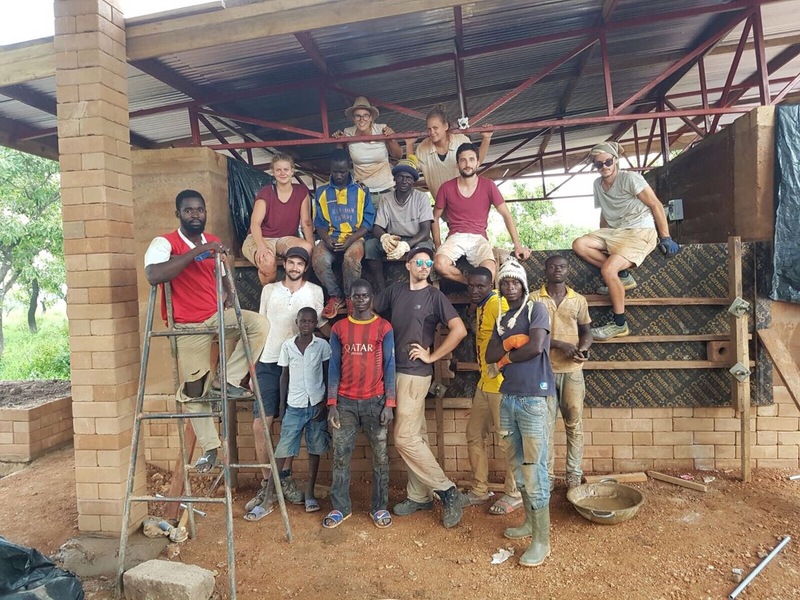 This also in some way was the case with the 31 volunteering students who were staying with us (in turns) in Sang and assisted us at the building site. 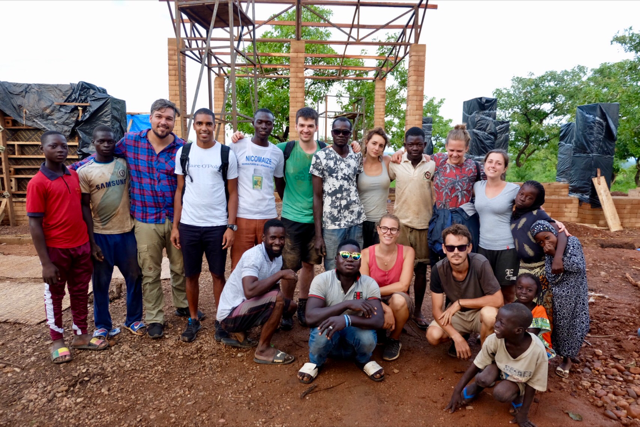 Few of the students had experience working on a construction site and for many of them it was probably the first time altogether on a building site. We did got help from building professionals a few times however. 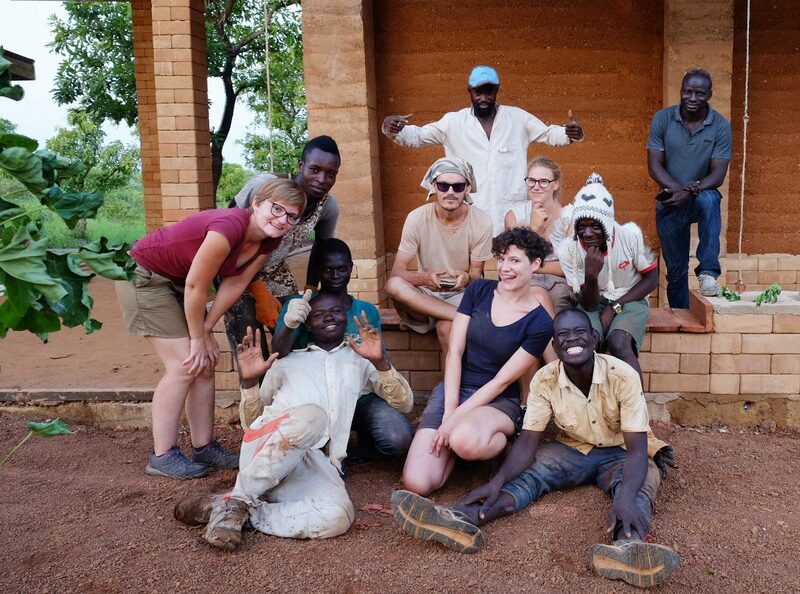 A specialist from Accra (team Hive) for example, helped us getting started with our first rammed-earth walls, a carpenter team from Tamale build the doors and windows and a mason helped us with plastering and finishing the floor. Also the local welder has been an important contractor, taking care of all the trusses as well as all kinds of other small (repair) tasks. But despite the practical skills these skilled laborers brought along, it was still challenging to communicate tasks as most of them cannot read blueprints. This has lead to several mistakes because instead of following our instructions and plans, decisions were made based upon personal assesments. 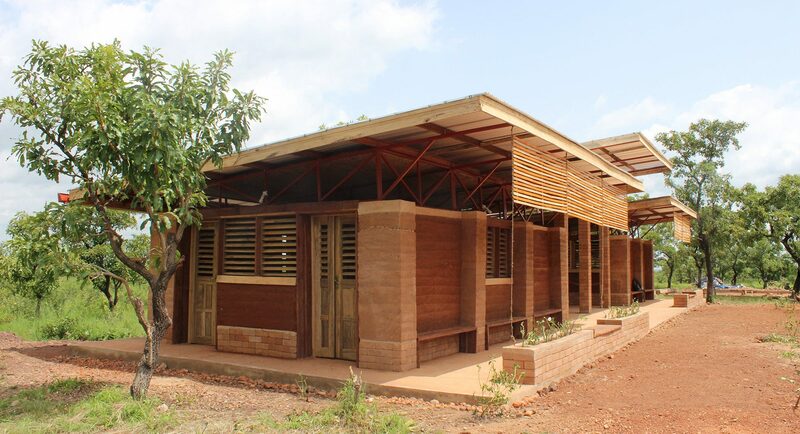 One of our overall project-aims was to build a sustainable and low-cost structure. We deliberately decided not to ship tools and materials from Austria, as it makes more sense to use locally available materials in order to support the local economy. 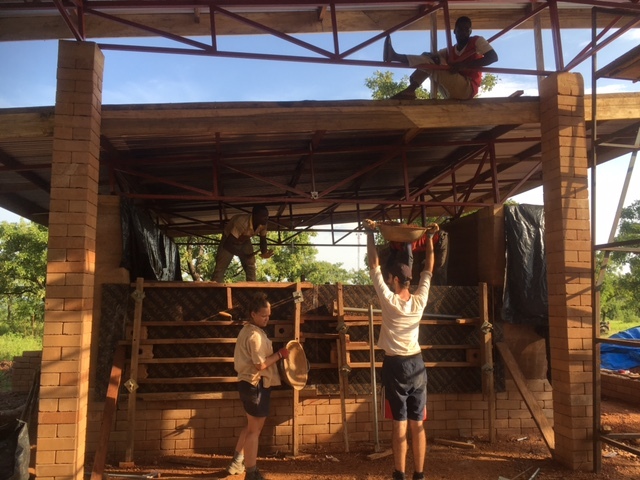 Although we have had to order some parts from Accra (form-ties and plywood) all other materials and tools we bought either in Sang or in Tamale (1,5 hour drive away and the third largest city in Ghana, approx..800.000 inhabitants) . This is not a straightforward task as there is no such thing as a general warehouse for building tools and materials in the region. In Tamale there are a lot of small stores spread over town that each sell a few materials or tools. As such, we several times had to sweep the entire town to find what we needed, which took a lot of time. Luckily, our main contact-person from the NKA lived in Tamale so after some time we decided to have him arrange most things and ship it to us. 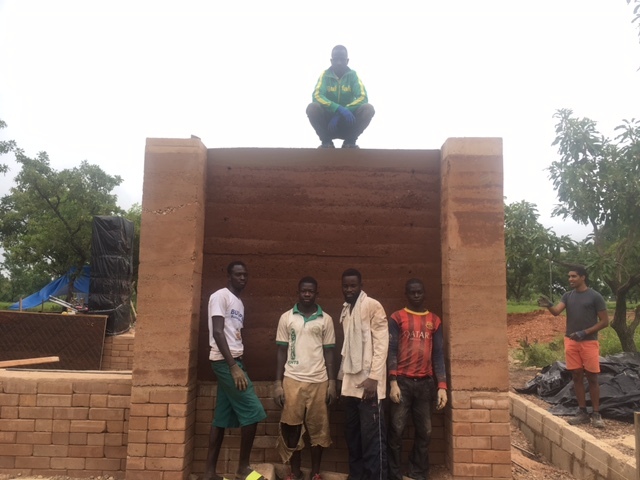 Although this was not without any (communication) difficulties, it saved us the trouble of going to Tamale too often and fully concentrate on the construction work on the site. 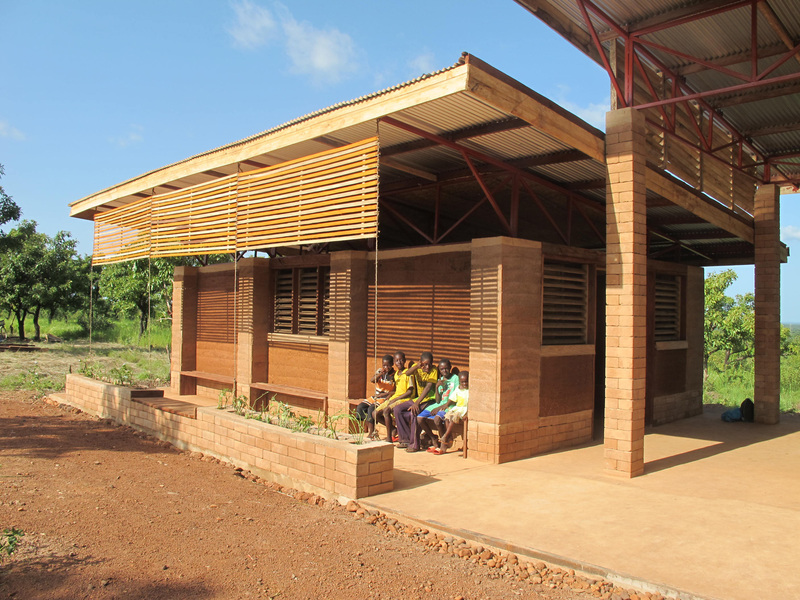 Another complicating factor that comes with building in rural Ghana, is that many things done in Europa by machine, are still done manually. To make concrete, for example, we had to mix the different substances with shovels on the floor. This is very intensive and hard work and you can only produce small quantities at once. So when you are pouring a foundation you have to do this in many small sections which make it more complicated to control the overall level. Also the ramming of the earth-walls had to be done manually instead of using a mechanical ‘rammer’. Although this arguably was one of the more exiting processes of our workshop, it also implied involved a lot of blood, sweat and tears for building a wall section. 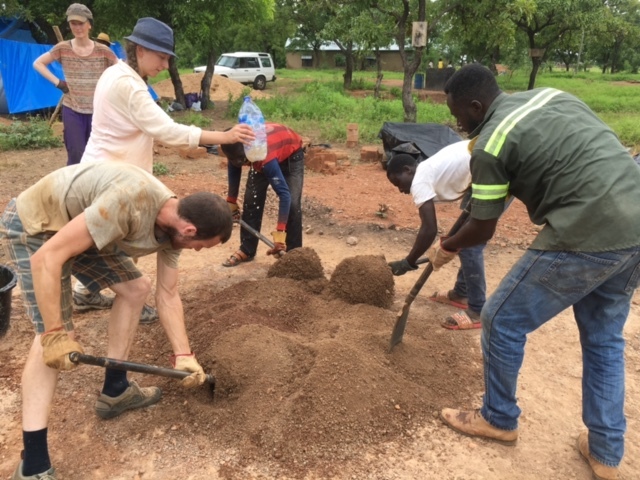 We did however find some electrical tools such as an electrical saw and an electrical drilling machine, but you have to pay a high price for quality in Tamale. Fortunately we brought some small tools (a spirit-level for example) with us that made our work slightly easier. So even when you do not ship a container with tools over, we highly recommend to bring certain ‘high-tech’ tools along as you don not easily find quality tools in such rural regions. Although we often considered many different solutions and approaches during the construction process, we ultimately have stayed very near to our original design (see images below). Taking into consideration all the challenge we have faced, including also many health problems, we are very satisfied with how it has turned out and happy to finally share the final result. There is of course a lot more to tell about the whole process but we will get into some more detail in the final report we are working on. We want to thank all our sponsors and donors again for having made all this possible and we truly hope the vocational school will have an impact on the future of many children in Sang. We also want to thank our volunteers again for their efforts. It is absolutely noteworthy when people sacrifice time and money to help out for some weeks free of charge. Of course also as our team of local workers deserves to be mentioned here as they really gave their best everyday despite the sometimes very strenuous work and heat. 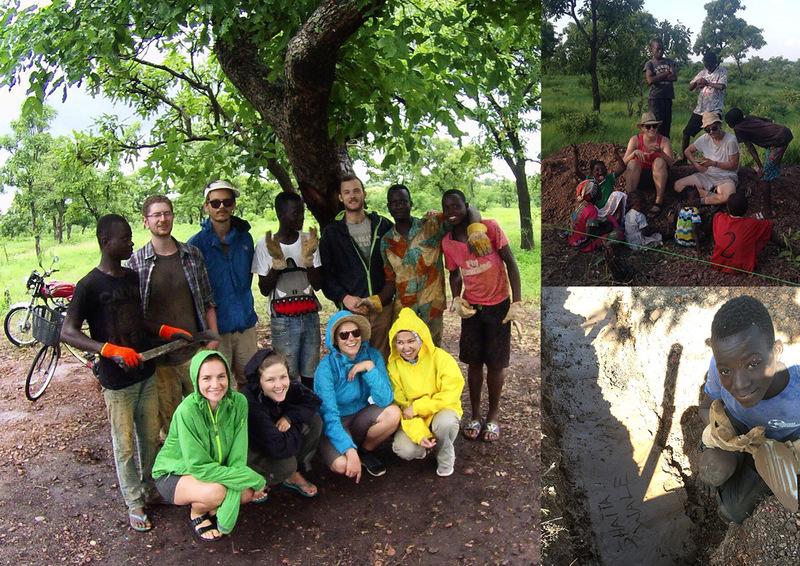 We, as MUDcafeteria team, hope to facilitate more of such social-projects in the future, for now however, our job is (more or less) finished and we will cease our activities for the time being. Take care and hopefully till soon!